29 experts. will be speaking. Starts at 8:30 AM. 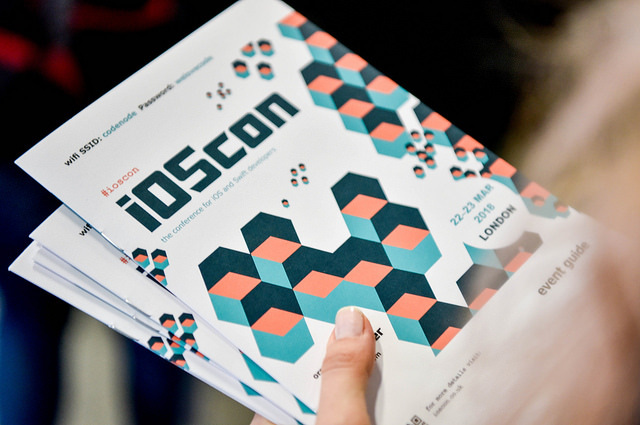 iOSCon 2019 is the go-to conference to discover and learn all the latest developments in the iOS and Swift world. Join leading experts in the iOS & Swift realm, who will share the latest technologies, tools, ideas and practices developing and evolving within iOS, Swift and Mobile Technology. 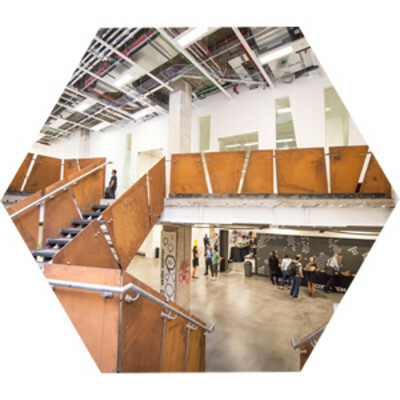 We are very excited to announce that 2019's programme will include keynotes from John Sundell, Gwendolyn Weston, Jessica Rose, Daniel Steinberg and Jaimee Newberry. Keep an eye on the programme for all the updates to the line-up! Registration is open and we have some great Early Bird Tickets available. So if you are planning to join us for two days packed with iOS fun, don't miss your chance and book your ticket today! Call for Papers is Now CLOSED! The Call for Papers is now CLOSED! 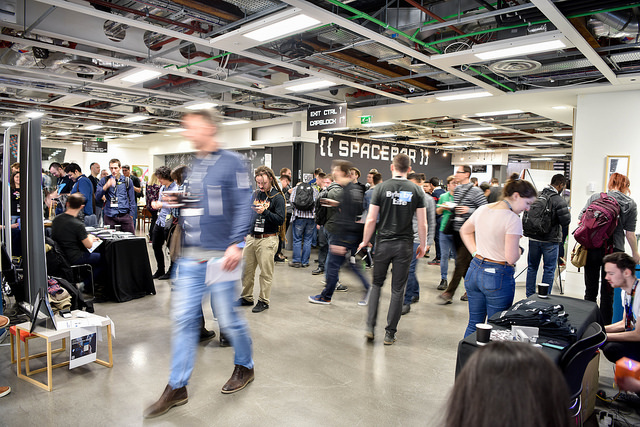 Thanks for submitting a proposal, the response's been overwhelming and we are currently working on selecting talks. Click here to stay up to date and find out more on speakers as we'll start publishing the line-up very soon! Don't miss these amazing talks! Welcome to iOSCon 2019 Day 1! You all have to make decisions every day — both in your personal life, and in your lives as developers. But making good, solid, decisions that stand the test of time can be incredibly difficult. What framework to choose for networking? Should you adopt new Swift language features right away? Functional programming or imperative statements? In this Keynote talk, John will talk about how he makes these kind of decisions on a daily basis — for both big apps and small — and give lots of examples, tips and tricks on how to become a better tech decision maker. John builds apps, games & developer tools. He also makes Swift by Sundell - a series of weekly articles and a podcast about Swift development, and co-hosts the Stacktrace podcast. He has worked for companies like Volvo & Spotify, and is now working full-time on creating apps, tools and content for the Swift community. Notifications can be a double-edged sword: they can bring users back into your app, or if too frequent, cause them to delete your app forever. Notifications are often used to send your users important or time-sensitive information -- but how do you implement these features while respecting the user's attention? At Slack, notifications are essential to their product. They have shipped numerous features that provide their users with the ability to decide on how and when they want to be informed. In this talk, Kaya will go over how you can provide users with more control through customised notifications, and how to write unit tests for your notification code. Kaya will share some examples of problems they've come across at Slack and how using protocol-oriented programming, mocking, and dependency injection has allowed them to ensure their notification code has test coverage! After the talk, you will know how to write notification features that are more stable and well architected while still providing value and control to your users. A lot of the time privacy of your data as a user is not a priority for developers. Whether it’s your calendar, your contacts, or your location, as a user you want to be able to use an app without all of those attacks in your privacy. In this talk, Manuel will explore some things an iOS and macOS developer should do to ensure the most critical user can still use your app in some regards, so your product does not just demand, “I need all your information,” like on other platforms. This is the beauty of the Apple Platforms: being able to fine grain (although not enough). So, let’s do this all together as a beautiful community concerned by privacy. Manuel started with his Commodore 64 at age 11 in 1987. “Stuff” as he’s called in the community became a Pro Software Dev in 1997 after 3 years of CS. He started the first french podcast about Apple in 2005 and started developing for iOS in 2008 and with Swift since 2014 (pre-1.0). If you have a project/an app that needs to be looked at from the perspective of Privacy or Energy Consumption (his other passion), ask him @stuffmc ! He has been running https://swiftconf.com/ from 2012 to 2017. Nick has been building iOS apps since 2009 and currently works at Lightricks in London. He is the author of iOS Core Animation: Advanced Techniques, and is responsible for several popular open source frameworks including iCarousel, SwiftFormat and Layout. • iOS engineers will encounter ‘legacy’ iOS apps (apps where the majority of architecture was built with outdated language, APIs and toolset references). • When encountering such apps, the challenges of working within the constraints imposed will be greater. • There will be a need to evaluate the value of continuing development of such a legacy app versus alternatives such as a rewrite. • Review of common problems/patterns encountered in legacy iOS apps as well as the typical challenges those introduce to a refactor strategy. i.e. KVO, early/immature use of managed object context, etc. How to evaluate technical complexity of options. Risks associated with either strategy and how to weigh these based on you team or product. Should be shaped around business success & flexibility. Metrics talk (and inform) - use metrics to reach your decision and track your progress through the strategy you choose. Julietta works as an iOS engineering consultant in Brooklyn, NY. She’s been building software applications for more than 12 years, first learning the ins-and-outs while working as a software consultant for Agile & TDD champion, ThoughtWorks. Since then she’s been an active member of the NYC startup scene, specializing in architecting iOS platforms for startups of all sizes and needs. She’s lead teams and is active in the entrepreneurial community and also runs the Brooklyn Swift Developers meetup. Think you know Xcode? Think again. In this talk, Sean will run through 30 hands-on tips ranging from intermediate to advanced, so that each and every attendee will walk away with something new they can take back and implement in their daily workflow. Do you know the keyboard shortcut to quickly create documentation? How about playing a specific sound at a breakpoint or when your tests fail? Oh, you knew those? What about showing a view that displays who last edited a line of code and in what commit? 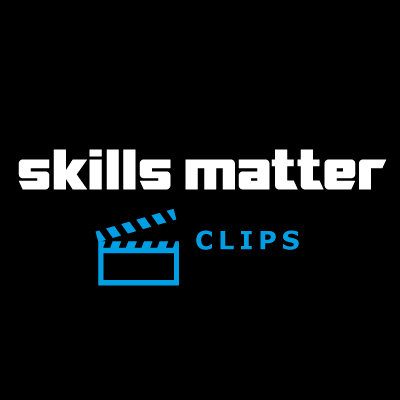 Each tip will be demonstrated live on stage so you can see exactly when and where it’s useful. Whether you’re writing Swift or Objective-C, after this talk you’ll be able to work faster and more efficiently in Xcode, so you can spend more time scrolling Twitter... I mean, working more productively. Sean runs an iOS Development YouTube channel with over 35,000 subscribers and also works at a small startup in San Francisco. He hosts Swift News, a weekly video show rounding up all the latest happenings in Swift and iOS Development. Sean also co-hosts the podcast, Swift Over Coffee, with Paul Hudson. When he isn’t nose deep in all things Swift, you can find him on the basketball court getting buckets. Realtime Video has been the online king of the past few of years, while Augmented Reality (AR) has been steadily getting closer to enhance your day-to-day 'real' world experiences with useful on-demand virtual elements. In this talk, Manik will share with you how AR and real-time video intersect using both ARKit and WebRTC to render video frames on virtual elements to create a 'visual' virtual conference room that one can enjoy. Manik is a Developer Advocate at Nexmo based in San Francisco where he focuses on real-time communications and mobile development. He enjoys working with developers across both iOS and Android platforms. When he’s not building mobile applications, he’s aspiring to be Iron Man. When you encounter Functors and Monads you ask yourself, “When am I ever going to use this.” The answer is, “you already do.” In this talk Daniel will explore Functors and Monads in everyday life and share with you some accessible examples. Daniel is the author of the best selling books 'A Swift Kickstart' and 'Developing iOS 7 Apps for iPad and iPhone' (the official companion book to the popular iTunes U series from Stanford University). Daniel presents iPhone, Cocoa, and Swift training and consults through his company Dim Sum Thinking. He is the co-host of the Tiny Challenges Podcast. When he's not coding or talking about coding for the Mac, the iPhone, and the iPad he's probably cooking or hanging out with friends. Information on his books is available on the Editors Cut website. Details on his training, and speaking is on the Dim Sum Thinking website. Consulting about architecture and best practices for big companies and startups is the closest you can get to being The Wolf (Pulp Fiction). Although there are excellent teams that do a great and professional work with the development of their apps, horror stories happen. The consultant gets a call when the technical debt is huge, right before some fellas "get their knees broken". In this talk Jorge will explore some not uncommon scenarios that big companies and startups face as a result of how they decide to develop their iOS apps. Architecture: When and why should you care about architecture? Is it for your team? Jorge will share with you that certain language features like structs, enums, or closures can simplify the adoption of a better architecture. Refactor or big bang rewrite: Should you start from scratch to do it right this time? Jorge will defend the value of refactoring and how to introduce Swift code in an already existing Objective-C project (if you aren't there yet). The testing dilemma: Is it worth writing tests? Or do you lose that time creating "non-productive" code? 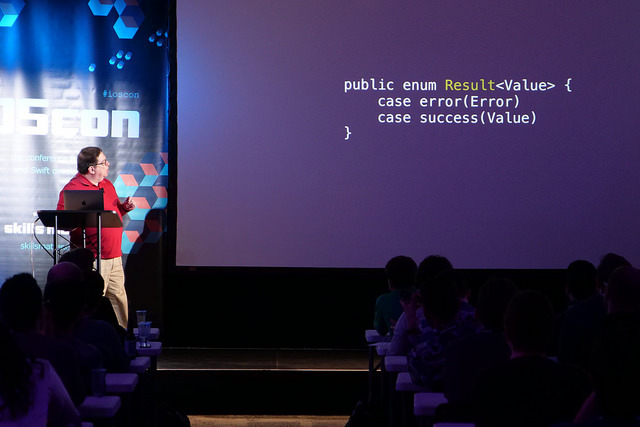 Jorge will claim the value of writing tests and give some examples using plain XCTest. Jorge will also explore Quick as an interesting alternative. The automation conundrum: Do you believe in Robots? Is CI&CD achievable? Jorge will obviously be on the side of automating all things and he will share with you the benefits of being able to build from the command line and how fastlane contributes to that. Jorge is a freelancer dedicated to mobile development, security, and systems architecture. He started his work as a developer at M.I.T. in 1993 and since has collaborated in numerous software projects. Most of them were internally for HP where he worked for more than 15 years. Since 2008 he has been working in different aspects of mobile development. After playing with PalmOS, he learned Android programming for the first Google App contest and immediately started to play with the first iPhone SDK. He is an instructor in the best iOS and Android Bootcamps in the USA and Europe, and has spoken at some of the world's most renowned conferences about topics relating to mobile app architecture and best practices (and occasionally about Go and Raspberry Pis). How do you start to play? How do you not get beaten while you are still learning? What are the best moves to make in the opening? What are common sequences of moves? And the answers could be transposed to programming as well: from the type and use of equipment, the proverbs that are meant to guide, Joskei and Fuseki around common patterns, even advice for how to improve at different levels. Transposition goes both ways and while Abizer looks at programming with fresh eyes, he is also improving at Go. In this presentation Abizer will share with you the lessons of Go as applied to programming, maybe the lessons of programming applied to Go . In this fast-paced workshop, you’ll learn how and when to add Siri Shortcuts to your app. New in iOS 12, Siri shortcuts allow you to expose frequently used aspects of your app that make your app easier to use. Daniel will cover two different techniques and discuss the pros and cons of each. 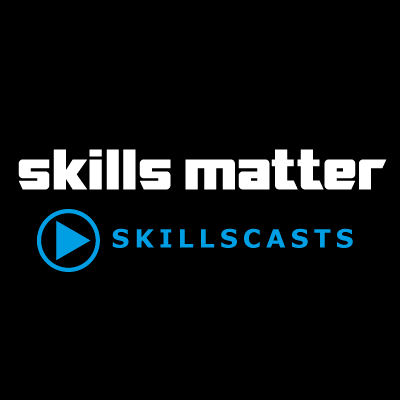 Cybersecurity skills are scarce and hard to attain. Being good at software development does not equal having good cyber security skills. During this workshop, you will go through a typical security question most developers handle in their apps. How to find out what data to protect, how to understand the weakest parts of the application, how to determine the best data protection strategies (data validation, encryption, access security, authentication patterns). And more important – how to use this knowledge during regular feature-driven development. What Anastasiia will not do is: cracking apps, writing custom encryption tools, discussing every bit of app security (because obviously, 90 min is not enough). What Anastasiia will share with you: actionable to-do list of things you might want to improve in your apps, deepen your understanding of the landscape of cybersecurity, a set of resources to read/dive next to make your apps even more secure. Anastasiia is a Product Engineer at Cossack Labs. She is an ex-mobile developer (started at iOS3) and full-stack security engineer now 🙂 She made dozens of apps for different industries working as contractor, often handling both iOS and backend sides. Then Anastasiia got interested in cyber security and she is now working as an engineer in a security company. She is maintaining open source cryptographic tools, engineering security software, consulting companies about data protection, and tutoring developers in building more secure applications. Occupational burnout leaves sufferers unproductive and miserable, with symptoms that closely mirror depression and other serious ailments. In this talk Jessica will explain occupational burnout, how to detect it and then look at possible routes back to a level of health and wellness that allows you to get back to building what you love. Jessica Rose is a technologist obsessed with fostering more equal access to technical education and meaningful work in technology. She's helping FutureLearn reach learners around the world as a technical manager. She's founded the Open Code meetup series, co-founded Trans*Code and runs the Pursuit Podcast. End of #iOSCon 2019 Day 1. See You Tomorrow! Welcome to iOSCon 2019 Day 2! If asked, could you explain how the code you write contributes to the business’ bottom line and adds value to the customer? When you get used to working by sprints and moving tasks along, you can miss the bigger picture of why you are building the things you do. This tension becomes especially important when balancing in bigger, long-term refactoring with putting out fires of the current state of the codebase. So how do you know which is the right approach for a situation, especially with the moving target that is product development? This Keynote talk goes into how to build alignment with product owners such that you are able to articulate the business value for your code and thus be empowered to make trade-offs for what the best use of your time is. Gwendolyn Weston is a Brooklyn-based developer and artist, currently the iOS Platform Lead at Audm where she works to make long-form journalism more accessible. Previously, she's worked with companies such as StitchFix, Apple, and PlanGrid. She believes community-building is the best kind of self-care, and has published a zine on how to make friends as an adult. Her favourite shade of purple is #A157E8. Learn how the use of continuous integration services that the BBC has evolved over the last few years. Tim will take you through a journey of the trials and lessons they have learned building their own CI infrastructure. Learn where he and his company started with boxes under desks and phones exploding to where they are now. You'll see how they scale and build both iOS and Android projects thousands of times a day. Tim is a software engineer at the BBC, working on the mobile playback team responsible for all aspects of media playback on iOS and Android. Additionally, he is responsible for the CI systems used to build and release every mobile application in the BBC. Outside of the BBC, Tim runs Broken Hands, a company specialising in Vapor and Server-Side Swift. A Vapor expert, he has presented at conferences around the world, including AltConf and iOSDevUK. He has published a book on Vapor and produced a video course for raywenderlich.com. 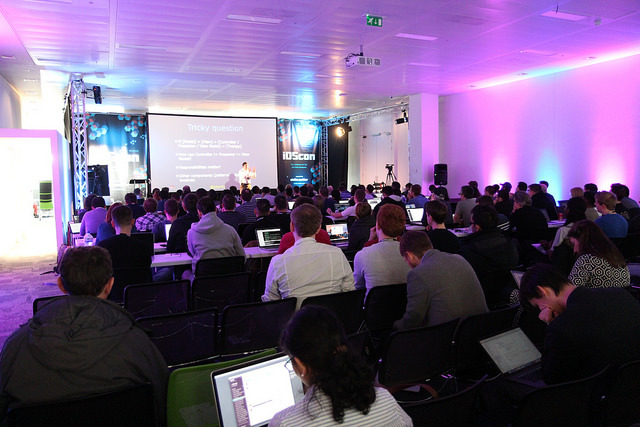 He also organises meet-ups around the world, including NSManchester, Vapor London and Vapor @ WWDC. He recently organises the world's first conference for Swift on the server in Berlin, ServerSide.swift. In this talk, Robin will share why you might want to embed UIViewControllers inside your UITableViewCells. Together with Robin, you'll explore a sample implementation (without doing any embedding/containment) and slowly refactor/reason about it to arrive at a subclass that lets you enjoy the benefits of both Containment and Cell Reuse. You’ll also explore an implementation in Texture (formerly AsyncDisplayKit) to see the benefits in code reuse. Robin Malhotra is an iOS engineer at GO-JEK, Indonesia's first "unicorn" company. His love affair with computers started with his dad’s hand-me-down IBM PC. He's a huge swift fan (both & Taylor) who spends his free time playing basketball (Go Dubs!) and working on open source. When he's not programming or wasting time on Reddit, he usually plays NBA 2K, Overwatch or Mass Effect. He's previously spoken at try! Swift Bangalore, and also speaks regularly at the Swift India meetups. Should you use Optionals for errors in Swift, or do-catch? Or perhaps something else? Or not bother at all and rely on Bad Things never happening? For some, it might seem that Swift's error handling strategy is fragmented and different for the sake of it. Phil will try to convince you that nothing could be further from the truth. In fact, he believes that Swift has one of the best error handling stories of any mainstream language - and actually unifies some historically disjoint approaches, that have always had serious trade-offs, into a cohesive union that has almost none! You'll look at what the Error Handling mechanism in Swift really is, how it works under the hood, and why it deserves your appreciation. With just a small amount of care, it is possible to write highly reliable code that performs excellently. Whether you’re just starting out with Swift, or you’re a seasoned veteran, there will be something for everyone in this talk. Phil is the author of the test frameworks, Catch - for C++ and Objective-C, and Swordfish for Swift. As Developer Advocate at JetBrains he's involved with CLion, AppCode and ReSharper C++. More generally he's an advocate for good testing practices, TDD and using the type system and functional techniques to reduce complexity and increase correctness. He's previously worked in Finance and Mobile as well as an independent consultant and coach specialising in TDD on iOS.re. Phil tweets at @phil_nash, and he writes a blog here. Across the mobile industry, there is often this great divide between the two platforms, iOS, and Android. The consumer arguments of which side is better, and what phones are better regularly leak into our work and quite frankly taint our ability to make great applications for our users. As developers, we are sometimes subject to the whims and biases of designers and product managers. However, we have to take responsibility for ensuring that our mobile products as a whole are enjoyable and consistent for our users. At Monzo, they have a culture of collaboration, which has resulted in the mobile apps becoming closer and closer in feature parity. However, there are still issues, and definitely lessons from the past, which Niamh will detail in this talk. Niamh will also delve into the issues with the more black and white thought processes that plague the industry, what damage they can cause and how much of a detriment to your product they can be. She will then go on to explain how, by working together and appreciating the benefits of both sides, you can ultimately design and build apps that everybody will love, and also be happier in our work. Niamh is a Mobile Engineer, working across both Android and iOS for the app based bank, Monzo. Having learnt both platforms in parallel, she enjoys bringing the best of each world together and transferring knowledge between them. Based remotely in North Wales, she is well invested in the local community, running the GDG Liverpool, and founding the new iOS meet-up, Swift Society. Swift has been evolving at a lightning pace ever since it was released, but even though ABI stability is finally on the horizon the rest of the language shows no plan of slowing down. During this talk, Paul will explore whether the Swift Evolution process is working as you all hoped, what's changing in Swift 5.0, and what's still needs to change in the future if Swift is to continue as a dominant, modern programming language. Paul tweets at @twostraws, and his website can be found here. Hidden Markov Models are commonly-used statistic models for sequential data often used in topics like speech recognition. Music has been composed through algorithms for a long time and recently with the improvement of deep learning methods, algorithms and models are now being used more and more to generate art. This talk will explore the usage of Hidden Markov Models with Swift in composing music, particularly Disney-like music. Various Hidden Markov Models will be trained on Disney music pieces and you will together with Lizzie consider the models’ ability to create new pieces that sound like they're from Disney. Lizzie is a San Francisco-based developer evangelist with Twilio and recent graduate of Bryn Mawr College in computer science. Besides iOS development with Swift, she enjoys reading, running, ping pong, and tennis. From input to information – ML to the rescue! Inputting information can be a tedious process, so how can you use machine learning to solve this problem? One smart approach is to input in a natural language and using machine learning to parse it into classified information. If you've ever used features like Quick Add in Todoist you'll have seen this in action – machine learning can work so well it almost looks like it’s magic. Even if you don’t know anything about machine learning, come and learn how you can use Apple’s Natural Language framework in combination with other tools to recognise information in a smart, simple way. Mukesh is an iOS Developer who is currently leading the mobile team at Applozic. He is mostly working on messaging SDKs which are used by millions of users. Interested in machine learning specifically natural language processing. When Graham adopted Test-Driven Development, he turned his back on testing. People think that if they write a couple of tests that show the happy path and the error path, then they have "100% coverage" and are done. If they add those tests to their continuous delivery pipeline, running with the same inputs on every build, then they get "a full regression suite" and can be confident in that they did not break anything. In this talk, Graham will explore techniques that demonstrate that his software works not just for the few examples he thought of when designing it, but for _all_ inputs. Graham first learned Objective-C while sat in front of a NeXT Turbostation, and was hooked on its power and simplicity. His career has seen him writing Mac and iOS apps, Java software for particle accelerators, node.js microservices and more. He has written books and given talks for Cocoa developers on application security and test-driven development, and more generally on object-oriented and functional programming, and the skills a programmer needs that aren't programming. ABI stability can be quickly understood from a high level when explained as ‘You’ll be able to run code written for older versions of Swift on new versions of it’s compiler.’ Developers get this benefit as they’ve experienced the pain of not being able to do this for several years. This talk will go into how ABI stability is part of the maturing process of any compiled language and how Swift’s story… both it’s origins and progression are sourced in the LLVM and how ABI stability fits into that broader picture. Review the origins of Swift and how it’s creation was really sourced in Apple’s adoption of and advancements to the LLVM. What drove this for Apple and what you can observe today. How the LLVM’s dynamism is enabling performance gains throughout the compilation chain. This is the reason ABI stability hasn’t been reached. Implications to the compile chain when it has. What's after ABI stability for Apple, it's hardware and iOS/macOS. You can review Julietta's article series written on the LLVM here and here. iOS interviews are stressful. The questions are tricky. You don't immediately know the answers, so you nervously rush to figure them out. It's almost like the interviewer is rooting for you to fail… or are they? As someone who has a ton of interviewing experience on both sides of the table, Alex has seen a lot of potentially good candidates get rejected because of simple mistakes. It's heartbreaking. Alex wants to help everyone unlock their potential as interview candidates and really be able to show off what they know. Most interviewing workshops seem to focus on the frameworks, algorithms, and trivia that you need to learn. Instead of focusing on memorizing, learn what your interviewer is actually thinking (and wants) and how to use that to win at interviewing. Alex Karp is an iOS Engineering Manager at Wayfair, his team focusing on the very bottom parts of the conversion funnel in their iOS apps: The checkout process, shipping information, and loyalty and financing programs. He lives near Boston with his girlfriend and an adorable young cockapoo. In his free time, he brings back the 1920s via his love of dancing and teaching Lindy Hop. In this session, you will learn about Sourcery, the metaprogramming tool for Swift. Gabrielle will explain what Sourcery is and the benefits of automated code generation. She will explore how to use Sourcery by working through real examples, showing how to auto-generate boilerplate code. She will share how Sourcery fits into the development process. Finally, she will give a balanced overview of the pros and cons of using Sourcery. Femi, aged 13, started coding when he was just 8 - hacking Minecraft using Python on the Raspberry Pi. He wanted to share what he'd learnt with his friends from his Tourette Syndrome support group which led to him setting up South London Raspberry which has run inclusive coding and robot workshops both here and abroad. he has won awards and praise from the Prime Minster for the work he has done the community. Femi was named on the Independent's Happy list and was recognised as one of the London Tech Advocates, 25 Under 25s rising talents. He has his own business and website, hackerfemo.com and has helped develop a Young Coders MeetUp which is hosted at Red Hat's Open Innovation Labs in London. Presently he has partnered with Imran Hassan to develop an App to help Deaf children with literacy. 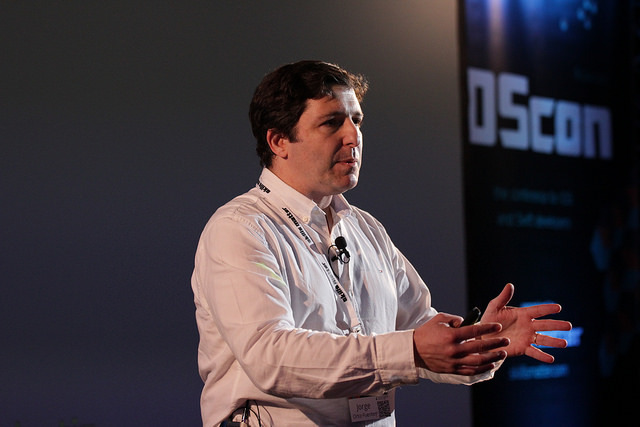 He also presents inspiring Keynote talks on the topics of Young Coders, Cybersecurity and Open Source community. Imran, aged 16, studies IT at Lambeth college and has recently started to code whilst attending the Young Coders MeetUps at Red Hat. He has partnered with Femi Owolade-Coombes to develop an App that will help young deaf learners, like himself, to spell words rather than just learning the sign language, as it impedes literacy development. 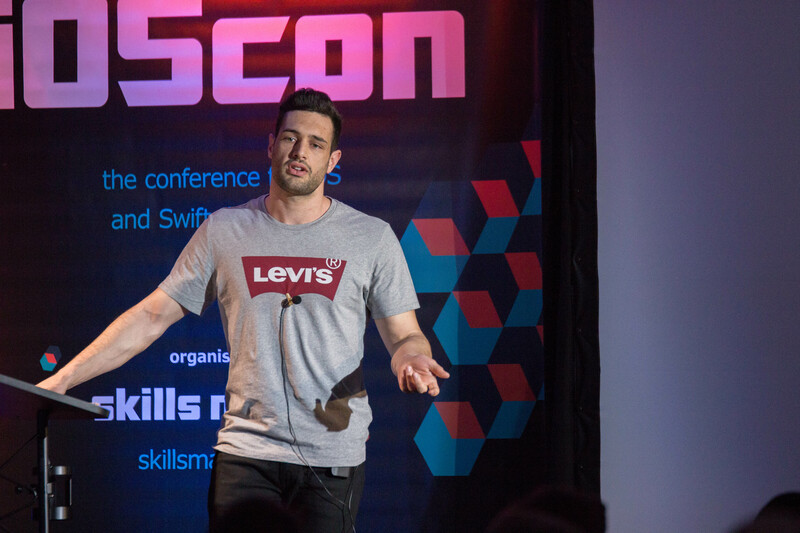 Paul is a software engineer, trainer and speaker specialised in data-driven solutions on Apple platforms with an emphasis on prototyping, best practices and balance with agility. He started programming back in the days of Fortran, graduated with a PhD in Computational Physics from UCLan and currently hailing from London, UK. He blogs on Medium, often tweets here and in his spare time, is bootstrapping Event.Run. Business apps are mostly written with the thought “Written once, run everywhere” which is not the full truth. In this lightning talk Kevin will share with you why business apps should be treated like an end consumer app and why user experience is important in the business realm. is a software developer at SAP with a passion for mobile. He is also a guitar hero & martial arts sportsman in training! His first experience of building Swift based SDKs was when he and his team were building a SDK for the healthcare sector to help developers build applications for this specific industry. His main skill set is in building design and customer driven mobile business solutions and building UI reuse components for SAP's new Swift SDK. After working in the Web Interaction Design & Development industry from 1998-2013 with emphasis on empathetic and behavioral psychology-applied interface design for web, mobile web, and iOS applications Jaimee realized she had accumulated a lot of tools for building great "stuff" and decided to run an experiment on herself. In this talk, Jaimee will share how the practice of being a tool builder by trade gave her the tools she needed to rebuild her life and go on to co-found a company that she believes is the best work of her life. Jaimee worked in the Web Interaction Design & Development industry from 1998-2013 with emphasis on empathetic and behavioral psychology-applied design for web, mobile web, iOS + Android applications. Currently, Jaimee is the co-founder and CEO Picture This Clothing (PTC). PTC started as a passion project launched by a single Tweet from her personal Twitter account the morning of March 17, 2016, had a TechCrunch write-up by the end of the same day, and a viral burst immediately following. Now Picture This Clothing is Jaimee's full-time focus. She also serves on the board of directors for mobile applications development firm, MartianCraft. Across her career, she's worked with high profile companies like Apple, Disney, Nintendo, Zappos and many more. "I'm fueled by fun, Muppets, Disney, and a heavy sprinkling of rebellion. My mission is to contribute something positive to the world and create tools that allow others to do the same." End of iOSCon 2019 - See you in 2020! SAP’s Developer Evangelist Kevin Muessig talks about how to meet business user expectations using iOS and why is it important in the business realm. Can you tell us a little bit more about your business app experience? I am an iOS developer who recently transitioned into an iOS evangelist where I got insight of how decisions are made about apps in the business realm. What do you think is the biggest problem with business apps? I’ve often experienced that when it comes to business apps, we think of it as building it once and running it everywhere without thinking too much about meeting the business user expectations. What will you be sharing with iOSCon's attendees during your lightning talk? I would like to share why business apps should be treated like an end consumer app. I will also touch base on the various SDKs that we can leverage and why I think a business app user wants an experience that is fully featured, performs and looks like it belongs on that platform. Interested in joining Kevin and other experts at this year's conference? Check out the Programme Page for more info! 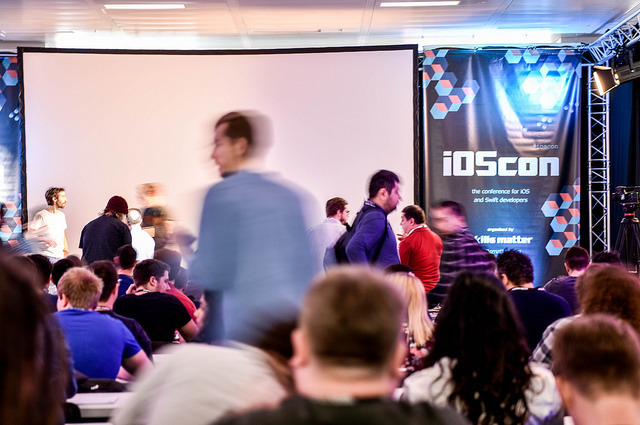 The iOSCon London 2019 Diversity Scholarship Plan is now closed. Please apply for the 2020 Scholarship from the 23rd March 2019. Call or email our team about the iOSCon Fringe Package for a special discount on bundle tickets! Passionate about clean architecture and want to learn how to implement best principles and practices while building complex mobile applications which don't compromise on integrity and flexibility? Join this 3-day workshop to develop your theoretical and practical knowledge of advanced architectures in an iOS context. Want to learn to build beautiful Flutter apps that users can navigate through easily, fetching data along the way? Join this hands-on [two-day workshop] with Brian Egan, for a crash course in creating high-performance apps which ship to iOS and Android using a single code base. Whether you are seeking to improve visibility of your tools, devices or projects, or simply would like to support iOS' passionate community through your engagement, our sponsorship team will be able to help you select the best sponsorship package for you! 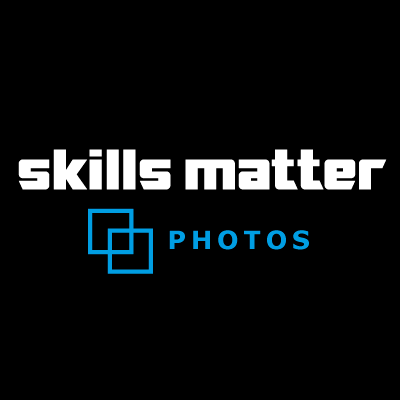 Email sponsors@skillsmatter.com or phone 0207 183 9043.
Business apps are mostly written with the thought “Written once, run everywhere” which is not the full truth. In this lightning talk Kevin will share with you why business apps should be treated like an end consumer app and why user experience is important in the business realm. Occupational burnout leaves sufferers unproductive and miserable, with symptoms that closely mirror depression and other serious ailments. Swift has been evolving at a lightning pace ever since it was released, but even though ABI stability is finally on the horizon the rest of the language shows no plan of slowing down. iOS interviews are stressful. The questions are tricky. You don't immediately know the answers, so you nervously rush to figure them out. It's almost like the interviewer is rooting for you to fail… or are they? ABI stability can be quickly understood from a high level when explained as ‘You’ll be able to run code written for older versions of Swift on new versions of it’s compiler.’ Developers get this benefit as they’ve experienced the pain of not being able to do this for several years.